Community Financial Resources is a non-profit organization. Our mission is to connect people with consumer-friendly and low-cost financial services. 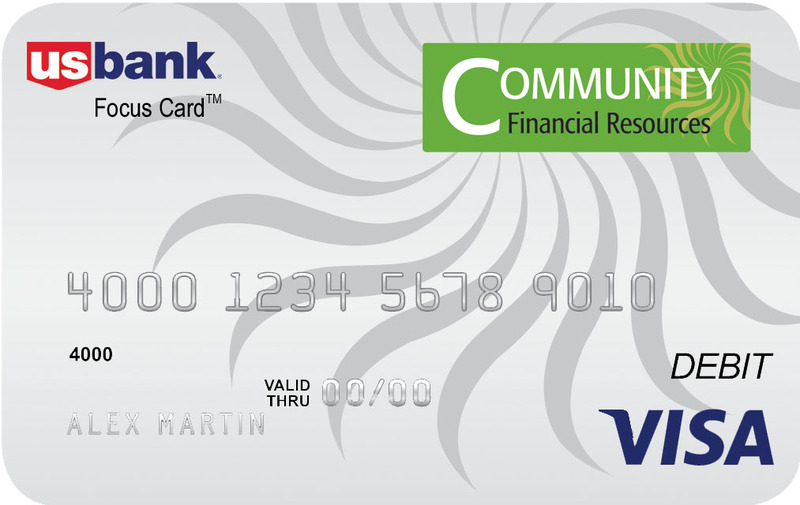 We created the Community Financial Resources Prepaid Debit Card program because we wanted to offer a Better Way to Bank. A prepaid debit card looks like a credit card and acts like a credit card but when you use it, you are spending your own money — rather than borrowing money from the bank and creating debt. You can Load your own money onto the card by setting up Free direct deposit of your paycheck, benefits like Social Security, or even tax refunds. Your money is safe on the card---it’s like putting it into a bank account! Why is this prepaid debit card program a better banking alternative? CFR has partnered with U.S. Bank to offer special access to the Focus Card. Open a card account with a valid Social Security Number, name, date-of-birth, address and phone and receive your personalized card within 7 to 10 business days. Unlike a personal check, the card is universally accepted – wherever a Visa debit card can be used. You can book travel arrangements, pay bills, make purchases on-line, mail-order, or over the phone. No monthly fee* - no special transaction requirements; better than most checking accounts. Unlike a traditional bank account, there is no minimum balance required and it is very difficult to overdraft. The card comes with a savings account! Open the savings account with $10 and set-up automatic savings features to build your savings. *If an account with a balance has no activity, after 90 days a monthly fee of $2 is charged – if there is no balance, there is no charge. Once you get your card, order a free 'joint-account' card to share money with a family member or close friend. You can transfer money between separate independent Focus Cards either on-line or calling Customer Service. Budget your income and expenses by reviewing 12 months of card transaction history on-line. Fast, reliable, convenient and safe: The average person can spend between 8 - 24 hours a year cashing or depositing checks. If you’re sick, on vacation or travelling, you will get your paycheck automatically. Your paycheck can’t get lost or stolen. Click here to learn about direct deposit. *In accordance with the USA PATRIOT Act, a Federal law requiring all financial institutions to obtain, verify, and record information identifying each person opening an account, you will be asked to provide your name, address, date of birth, and other identifying information. You may also be asked to provide additional documentation as proof of identification. Depositing funds to your card is contingent upon successfully passing this mandatory identification confirmation. Enrollment is Secure, Fast and Free! Community Financial Resources is a non-profit organization. Copyright © 2009-2011 Community Financial Resources. All Rights Reserved.